@zerohedge "You don't buy GDP futures. 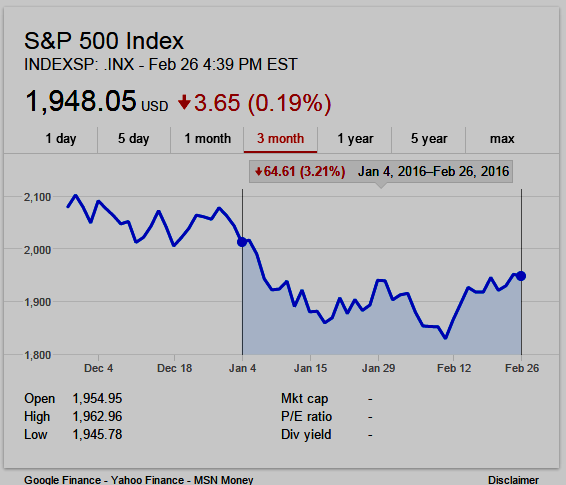 You buy S&P 500 futures." So Jonathan Golub is dead wrong on this. #NETmundial Initiative, L Strickling: some members of Coordination Council wanted this mtg closed. Some of us had to push to make it open. Funding by the founding 'partners' ICANN, World Economic Forum (WEF), and CGI.br ends June 30, 2016 [ICANN CEO Fadi Chehade announced at the meeting that the new ICANN CEO and the ICANN Board will determine at a later date whether to continue any funding beyond June 30th. Chehade also announced his resignation from the NMI Coordination Council effective March 13, 2016]. The Council considered and accepted a proposal for CGI.br to provide an institutional home for the ongoing initiative, subject to approval by CGI.br’s Board. The Council discussed the possibility of changing its current structure following a broad community consultation. The current open request for nominations to the Coordination Council is withdrawn. Once the public consultation is complete, a new nomination process will begin. Two activities were proposed for 2016, sponsorship for which has already been secured: (1) Document a set of good practices for national multistakeholder Internet governance structures and mechanisms; (2) Pilot the application of such practices in sub-Saharan Africa, including a conference to share learnings from pilot participants. A follow-up meeting of the Coordination Council will be held in Brussels, Belgium, on 8 June 2016. NETmundial Initiative: "Council members are currently considering the future direction of the NETmundial Initiative, and will make decisions at the Council's face-to-face meeting in Madrid, Spain, on 26 February 2016. In the meanwhile the nomination process for a new Council announced previously is on hold pending the outcome of that meeting." Date: 26 Feb 2016 - Remote Participation: Adobe Connect Room. 08:00 - 08:30 Welcoming Remarks from Host, Co-Chairs Overview of Achievements. 08:30 - 10:00 WEF [World Economic Forum] & ICANN Withdrawal: Financial & Political Consequences; Looking Forward - A quick reality check; value of NETmundial; order of magnitude of costs; potential new partners, etc. This session is meant to inform the next sessions. 10:15 - 12:00 Moving Forward - Share and explore feasibility of ideas presented in the non-paper and subsequent CGI.br position paper; relationship with the IGF. The NETmundial Initiative (NMI) was one of ICANN President and CEO Fadi Chehade's personal pet projects while on "ICANN's dime" (Fadi is Co-Chair, as is Jack Ma and others), reportedly funded (in part) by ICANN, though NMI has never received wide support from either the global internet community, nor the "ICANN community"--see NETmundial Initiative Lacks Backing, and ICANN Should Not Lead and other sources below. See also this ICANN Documentary Information Disclosure Policy Request (pdf) and Response (pdf). partnership between the Internet Corporation for Assigned Names and Numbers (ICANN), the Brazilian Internet Steering Committee (CGI.br) and the World Economic Forum (WEF). Its Inaugural Coordination Council consisted of 23 members ... Leading up to and following the initial scoping meeting of NMI in Geneva, Switzerland in August 2014, several actors in the broader Internet governance ecosystem expressed concerns over NMI's proposed organization and activities. Concerns intensified following the official launch in November of that year. ISOC, the IAB and ICC BASIS published statements outlining their concerns ... According to Julia Pohle in the Global Policy Journal, there were three main controversial issues surrounding NMI raised by civil society and the technical community: permanent seats on the NMI Council, potential interference with the UN Internet Governance Forum (IGF) and concern over disproportionate involvement in decision-making by economic and political elite. NMI retracted the notion of permanent seats on the Council, committed to supporting the efforts of the IGF and generated Internet Governance Process Principles to comprehensively address concerns regarding adherence to bottom-up, multistakeholder consensus-driven governance." @AkramAtallah I tried to bring you with me to #WEF but Klaus was very firm on this point. Could you ensure #ICANN still funds #NETmundial ? Recruitment for next #NETmundial Initiative Coord Council not going well. Deadline quietly extended to day before #ICANN CEO quits. Mobile World Congress is the world’s largest (attendance 93,000+ in 2015) gathering for the mobile industry, organised by the GSMA, and held in Barcelona, 22-25 February 2016.
a) For the first time, EVERY keynote at MWC16 will be streamed live to a dedicated channel. You can follow every keynote conference programme live online, wherever you are. More ISIS (Daesh) terrorist cells discovered inside Morocco this week, in addition to the cell of seven suspected jihadists active in Marrakech, Laayoune and Boujdour, uncovered earlier this month. Marrakech is the location of ICANN55 which meets March 5-10, 2016. Morroco now claims to have dismantled 152 militant cells since 2002, including 31 since 2013 that were linked to armed terrorist groups fighting in Syria and Iraq. Read more, including updates, at: DomainMondo.com: ICANN 55, Marrakech, Morocco: Travel Warnings, Threat of Terrorist Acts. ICANN Accountability WS1 Proposal (part of the IANA stewardship transition) delayed. The CCWG-Accountability Final Report was scheduled to be published and distributed to the Chartering Organizations on Friday, but has been delayed due to "concerns" of the ICANN Board of Directors expressed by its Chairman, Steve Crocker, in a posting to the CCWG-Accountability mail list on Friday--read more (including updates) at DomainMondo.com: IANA Stewardship Transition, New ICANN CCWG Accountability Timeline. Find links to all this season's Q4 2015 reports on Domain Mondo at the Stock Links page. Will the ICANN Board's "concerns" with the CCWG's ICANN Accountability WS1 Final Proposal be resolved? Mobile World Congress--MWC2016--(90,000+ expected attendance) meets this week in Barcelona, 22-25 Feb 2016 (Mobile World LIVE videos). Investing in China? Will the Chinese Yuan Lose 30% of its Value? Final Note: Don't miss Domain Mondo's earlier post today: Verisign Form 10-K for 2015, Domain Name Industry 'Must Read'. VeriSign, Inc. (verisign.com), domain name registry operator (.COM, .NET, and other TLDs), and Internet Root Zone Maintainer, has filed its 2015 annual report (Form 10-K) required by the United States Securities and Exchange Commission (SEC). It is a annual 'must read' for VeriSign investors (NASDAQ:VRSN), and the domain name industry. The entire report, including exhibits, can be accessed via the SEC's EDGAR here, or via the Verisign Investor Relations website. .com Registry Agreement: On November 29, 2012, we renewed our Registry Agreement with ICANN for the .com gTLD (the “ .com Registry Agreement”). The .com Registry Agreement provides that we will continue to be the sole registry operator for domain names in the .com gTLD through November 30, 2018. The .com Registry Agreement includes pricing restrictions for .com domain name registrations consistent with the terms of the Cooperative Agreement [with the US government which ends November 30, 2018, unless sooner terminated or extended]... Verisign pays $0.25 to ICANN for each annual increment of a domain name registered or renewed during such quarter. ICANN and Verisign are in the final stages of drafting the new Root Zone Maintainer agreement ... to ensure that root operations continue to perform at the same high level during the expected 10-year term of the Root Zone Maintainer agreement, ICANN and Verisign are in discussions to extend the term of the .com Registry Agreement to coincide with the expected 10-year term of the Root Zone. One customer [GoDaddy?] accounted for approximately 31% of revenues in 2015 and 2014, and 30% in 2013. VeriSign does not believe that the loss of this customer would have a material adverse effect on VeriSign's business because, in that event, end-users of this customer would transfer to Verisign's other existing customers. Risks arising from our agreements governing our Registry Services business could limit our ability to maintain or grow our business. Governmental regulation and the application of new and existing laws in the U.S. and overseas may slow business growth, increase our costs of doing business, create potential liability and have an adverse effect on our business. Undetected or unknown defects in our service, security breaches, and large-scale DDoS attacks could expose us to liability and harm our business and reputation. Changes to the present multi-stakeholder model of Internet governance could materially and adversely impact our business. We operate two root zone servers and are contracted to perform the Root Zone Maintainer function. Under ICANN’s new gTLD program, we face increased risk from these operations. The evolution of Internet practices and behaviors and the adoption of substitute technologies may impact the demand for domain names. Many of our target markets are evolving, and if these markets fail to develop or if our products and services are not widely accepted in these markets, our business could be harmed. We may face operational and other risks from the introduction of new gTLDs by ICANN and our provision of back-end registry services. The business environment is highly competitive and, if we do not compete effectively, we may suffer lower demand for our products, price reductions, reduced gross margins and loss of market share. We must establish and maintain strong relationships with registrars and their resellers to maintain their focus on marketing our products and services otherwise our Registry Service business could be harmed. If we encounter system interruptions or failures, we could be exposed to liability and our reputation and business could suffer. Our operating results may be adversely affected as a result of unfavorable market, economic, social and political conditions. Our international operations subject our business to additional economic and political risks that could have an adverse impact on our revenues and business. We rely on our intellectual property rights to protect our proprietary assets, and any failure by us to protect or enforce, or any misappropriation of, our intellectual property could harm our business. We could become subject to claims of infringement of intellectual property of others, which could be costly to defend and could harm our business. We continue to explore new strategic initiatives, the pursuit of any of which may pose significant risks and could have a material adverse effect on our business, financial condition and results of operations. We depend on key employees to manage our business effectively, and we may face difficulty attracting and retaining qualified leaders. Changes in, or interpretations of, tax rules and regulations or our tax positions may adversely affect our effective tax rates. Our foreign earnings, which are indefinitely reinvested offshore, constitute a majority of our cash, cash equivalents and marketable securities, and there is a high cost associated with a change in our indefinite reinvestment assertion or a repatriation of those funds to the U.S.
Our marketable securities portfolio could experience a decline in market value, which could materially and adversely affect our financial results. We are subject to the risks of owning real property. We have anti-takeover protections that may discourage, delay or prevent a change in control that could benefit our stockholders. We have a considerable number of common shares subject to future issuance. Our financial condition and results of operations could be adversely affected if we do not effectively manage our indebtedness. Perfect Storm? The Shipping Industry Has a Warning for the World Economy - Published Feb 11, 2016 - If the Baltic Dry Index is any guide for the global economy, the picture is looking stormy. 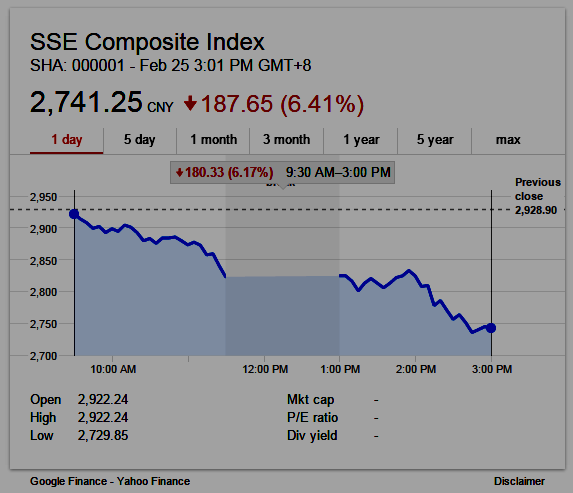 It's plunged to historic lows since the start of the year. Bloomberg looks at why, and what it could tell us about future growth. Baltic Dry Index - (Wikipedia): "The Baltic Dry Index (BDI) is an economic indicator issued daily by the London-based Baltic Exchange. Not restricted to Baltic Sea countries, the index provides "an assessment of the price of moving the major raw materials by sea. Taking in 23 shipping routes measured on a timecharter basis, the index covers Handysize, Supramax, Panamax, and Capesize dry bulk carriers carrying a range of commodities including coal, iron ore and grain." T-Mobile CEO John Legere discusses the company's growth, earnings and performance. He speaks on "Bloomberg Markets" on Feb 17, 2016. 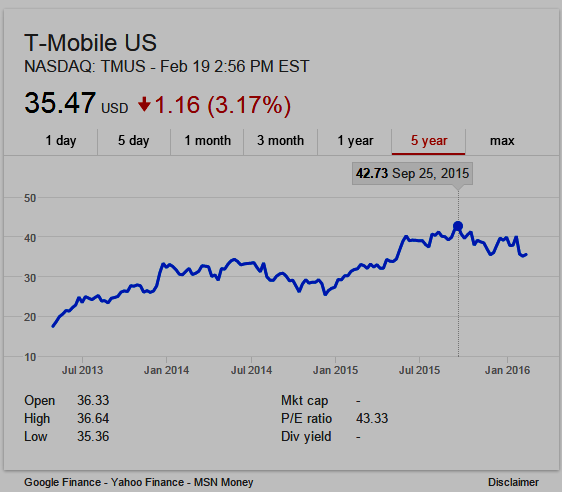 T-Mobile 5-year stock chart (source: google.com). $TMUS is down from its 12 month high. T-Mobile +4.9% after nearly tripling profits, capturing more users - T-Mobile US, Inc. (NASDAQ:TMUS) | Seeking Alpha: Feb 17 2016 "T-Mobile (NASDAQ:TMUS) is up 4.9% premarket after nearly tripling earnings on the back of 2.1M customer adds in Q4, while promotions continued to nip at revenues per customer. Net income rose to $297M from $101M. Total revenues were up 1.1%; service revenues were up 11.7%. 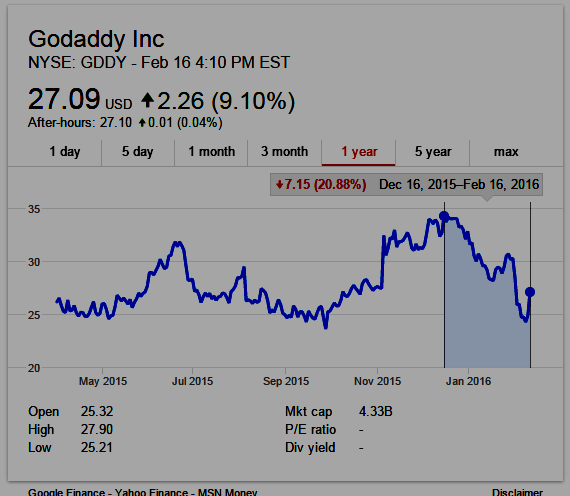 Adjusted EBITDA rose 30.2% to $2.3B." "I am submitting an updated verision of the Minority Statement which I sent yesterday..."
[CCWG-ACCT] Minority Statement of Individual Member Robin Gross (pdf): ".... "The CCWG-Accountability proposal includes a number of important and long over-due accountability reforms including improvements to ICANN’s Independent Review Process (IRP), Reconsideration Request process, board removal rights, and a noteworthy bylaws commitment to respect human rights in ICANN’s operation, among other truly laudable accountability reform measures. However, the long-term harm to a free and open Internet from the proposal’s shifting the traditional balance of power over ICANN in favor of governments and away from the Supporting Organizations and the private sector is a monumental mistake." [CCWG-ACCT] Appendix H - ASO Minority Statement: "... ASO, we would like to make a minority statement below, not on the recommendations but on "Appendix H: Bylaws Drafting Process & Implementation Timeline". Our statement is related to bylaws drafting process & implementation timeline, and not directly related to contents of the recommendations ..."
*Note: only appointed members (not participants) were permitted to file minority statements. All filed minority statements are in Appendix A (pdf) to the final proposal. For more information on CCWG-Accountability WS1 final proposal, see Domain Mondo: IANA Stewardship Transition, New ICANN CCWG Accountability Timeline. UPDATE: Apple Gains Silicon Valley's Backing in Government Fight - Bloomberg Business: “This is a classic legislative function, the courts aren’t really equipped to weigh the policies in the forum of a democratic society -- what’s more important, protection against terrorists or protections against your privacy?”--Robert Cattanach, a lawyer at Dorsey & Whitney who practices in areas of regulatory litigation including cybersecurity. Customer Letter - Apple: (February 16, 2016)--excerpt (read the full letter at the foregoing link)-- ".... A Dangerous Precedent - Rather than asking for legislative action through Congress, the FBI is proposing an unprecedented use of the All Writs Act of 1789 to justify an expansion of its authority. The government would have us remove security features and add new capabilities to the operating system, allowing a passcode to be input electronically. This would make it easier to unlock an iPhone by “brute force,” trying thousands or millions of combinations with the speed of a modern computer. "The implications of the government’s demands are chilling. If the government can use the All Writs Act to make it easier to unlock your iPhone, it would have the power to reach into anyone’s device to capture their data. The government could extend this breach of privacy and demand that Apple build surveillance software to intercept your messages, access your health records or financial data, track your location, or even access your phone’s microphone or camera without your knowledge. "Opposing this order is not something we take lightly. We feel we must speak up in the face of what we see as an overreach by the U.S. government. We are challenging the FBI’s demands with the deepest respect for American democracy and a love of our country. We believe it would be in the best interest of everyone to step back and consider the implications. "We learned on Tuesday evening that a U.S. federal magistrate judge ordered Apple to backdoor an iPhone that was used by one of the perpetrators of the San Bernardino shootings in December. Apple is fighting the order which would compromise the security of all its users around the world. "We are supporting Apple here because the government is doing more than simply asking for Apple’s assistance. For the first time, the government is requesting Apple write brand new code that eliminates key features of iPhone security—security features that protect us all. Essentially, the government is asking Apple to create a master key so that it can open a single phone. And once that master key is created, we're certain that our government will ask for it again and again, for other phones, and turn this power against any software or device that has the audacity to offer strong security. "The U.S. government wants us to trust that it won't misuse this power. But we can all imagine the myriad ways this new authority could be abused. Even if you trust the U.S. government, once this master key is created, governments around the world will surely demand that Apple undermine the security of their citizens as well.